St. Augustine’s regional history, local geography and diverse culture define, and importantly characterize – our place. Contextually, our place is far different than any other. Recognizing our context is the first step to preserving our unique attributes. We don’t need to be like everywhere else. As we grow our communities, we need to fuse the new with the old while insuring quality and originality. History reigns over our region. 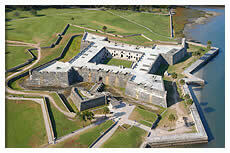 St. Augustine is America’s original city. Some historians claim the actual First Thanksgiving was celebrated in the stronghold on September 8, 1565, over 450 years ago and at least 56 years before the Pilgrims in Massachusetts. A visit to the Old Town can inspire inquisitiveness. Return trips illuminate the stories of early occupation. Familiarity induces multiple explorations and discoveries and an appreciation of the city’s proximity and accessibility. Our authentic sense-of-place is evocative of the history and heritage of St. Augustine as America’s initial melting pot. Our area is enveloped with natural beauty. The Atlantic Ocean, expanding to the east, was the historic conduit for settlement. It brings prevailing breezes and clean, crisp air. The Ocean and its coastline and beaches, provide remarkably attractive recreational opportunities. The cove-like arching coastline, well west of the warm-water Gulf Stream, provides a safe haven from tropical storms, unlike any other place along the Eastern Seaboard. The wide, north-flowing St. Johns River, beloved by John and William Bartram, is a national treasure. The River is Florida’s largest riverine system for water-resource and natural habitat preservation. It also affords immense, year-round recreational pursuits. The Ocean and River bookend massive conservation and preservation assemblages creating a great balance between our built environment and our natural one. We have a beautiful, environmental triumvirate – Ocean, River, (and copious) Natural Open Space. Culturally, our region is rich and growing in character. It is a classically southern place with warm hospitality and a friendly aesthetic. International attention and appreciation comes through exposure to St. Augustine – where many languages can be heard spoken along St. George Street. Ethnic cultures seem to prefer immersion over exclusivity – comfortable being woven into the community’s fabric instead of aggregating into their own enclaves. There are far more European, Middle Eastern, Asian, South American and Caribbean Islander residents here than one might think. During the last century of national growth, our region has appealed to southeastern, mid-western, mid-Atlantic and northeastern sensibilities. Even so – diversity is everywhere. History, geography and culture – we have it all – rare and unequaled in Florida. The role of context, in this regard, should be celebrated. When you and yours do – you will be rewarded daily, whether you choose to live or vacation here. Our Real Estate Agents, steeped in the history, heritage and traditions of our place, are the perfect resource to guide you in making lasting and meaningful connections to our community.